Following her appearance on the ‘Today’ show, Freida was spotted leaving the NBC studios in New York City wearing a Mara Hoffman dress. She styled her ‘Huipil’ print faux wrap backless dress with the same navy collarless blazer, Roger Vivier magenta ballet pumps and Tory Burch cat-eye rounded sunglasses. I am obsessed with this tribal print and the vibrant colours. This is one of my favourite looks from Freida’s promo tour of her new movie, ‘Trishna’. 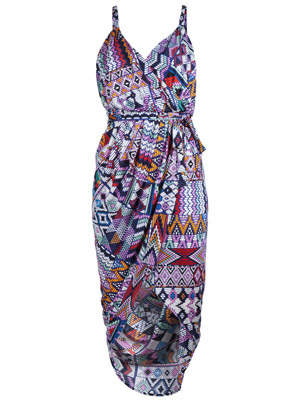 You can buy Freida’s Mara Hoffman dress farfetch US and farfetch.com.